Users who often look for missing files and documents in particular locations (folders, usb drivers or CDs) should take advantage of file indexing. With File Search Assistant it is possible to create index of files so that the software can easily locate missing documents. In simple words, indexes contain info in missing files, their details, possible locations etc. When users index files, FSA stores this info in index. Moreover, when new files are added to index, it will update automatically. Thus, for example, to easily find necessary files in a flash drive, it is best to create relevant index with appropriate settings. All paths are relative, which are, as known, very flexible, especially in terms of updating and changing location of files. To be able to index local documents, users should create relevant index file where they specify location, file types, contents, i.e. the complete information for File search assistant to look for missing docs really fast. Searching for files in index requires twice as little time as compared to conventional search procedure. 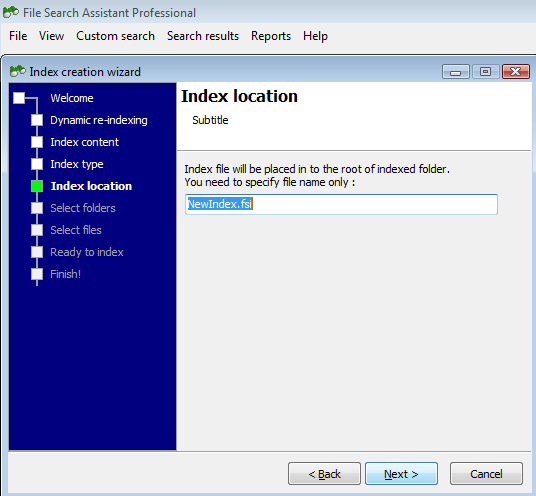 Use of index searches is recommended for users who often look for missing files in the same locations, for instance folders on desktop, usb flash drives or DVDs.